Myrtle knows her name and will come when called. 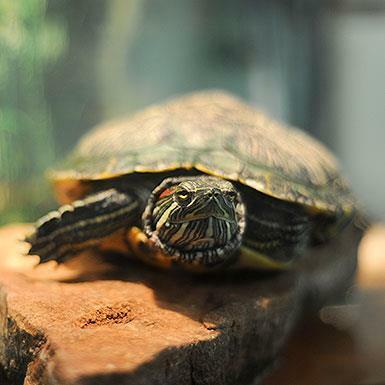 She is social with people and loves to spend time swimming and basking in the sun. 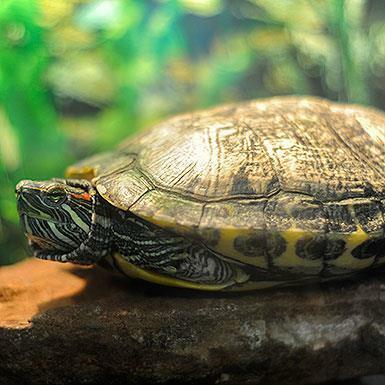 Sliders are a relatively large turtle and can reach up to 12 inches in length. They will need an aquarium with a decent depth of water to swim in (the bigger the better - they are semi-aquatic turtles after all), and a basking area under a full-spectrum light source. They have specific dietary needs, and we will provide that information for you. They love to watch you, they'll just about eat from your hand, and we're sure you'll love having them in your home. Myrtle was born in 2005. When cared for correctly, sliders can live 50-70. No sanctuary visit necessary, however, you must be within driving distance of Kanab to adopt. If you are interested in a slider, please fill out an adoption survey!